The sole survivor of a massacre of Texas Rangers, Tonto, an Indian who rescued him, and four other Rangers hunt down a schemer posing as a government official who wants to take over Texas with his small army of mercenaries. The five all fight valiantly but over the course of the serial four are killed in the line of duty, leaving only one to finish the fight -- The Lone Ranger. Our restoration of THE LONE RANGER (1938), long-considered a lost serial in complete form, is the only complete unsubtitled version of the serial available and the definitive edition of this classic serial. 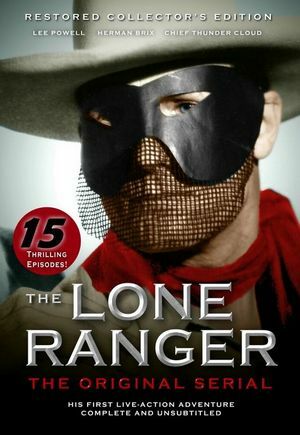 Influenced: The Lone Ranger radio and TV shows -- this serial introduced the massacre origin story of the character and rescue by Tonto as well as music and costumes used afterward in Lone Ranger programs. The 8 minutes of missing audio has been covered by new dubbing, all titles and recaps are presented in English and the picture element is composed of 99% high-resolution footage. After linking up with a wagon train, the Lone Ranger finds himself in the middle of a cattlemen/nesters struggle. Assumed incorrectly to be the bully boys of all the ranchers, but secretly under the command of Bart Dolan, a rancher's nephew, are the Black Raiders. False accusations, kidnapping, attempted lynching, ballot box theft, and the like abound till the closing episodes, which find the settlers gathered inside a fortress for a final showdown. 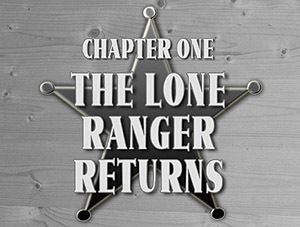 In this serial the Lone Ranger has a second partner in Juan Valdez, who at first wrongly believes the Lone Ranger to have murdered his brother, then fights beside the Masked Rider of the Plains. 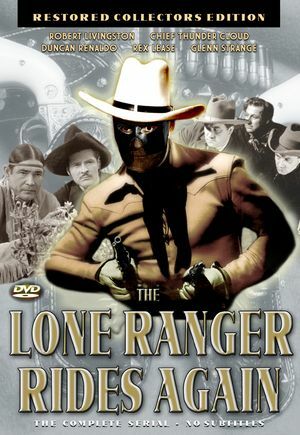 Unusually, the Lone Ranger appears frequently without a mask in this story, using the alias Bill Andrews. Transfer Quality: The digital transfer was created from the only known source print. This is the highest quality presentation of the existing film material and its first digital transfers. This restoration is designed to resemble the original theatrical release of THE LONE RANGER RIDES AGAIN as much as possible using elements which still exist, and subtitles have been removed using a technique which borrows visual information from existing unsubtitled film frames so some artifacts and letterboxing are sometimes present, usually at the bottom of the image, in repaired sequences. You can eliminate most of the visual residue of the pasteover-subtitle-elimnation technique and occasional letterboxing by simply watching this DVD on the “Zoom” setting on a widescreen TV.